This plant based meal really fits a strict vegetarian diet. The ingredients create a harmonious finish and earthy sweetness and aroma. It looks thick, smooth and creamy too! Rich, decadent spicy soup that is ready in less than 30 minutes. Look at this tasty picture – it’s perfect and will make you feel all warm and cozy inside when you eat it. And the chickpea topping is breathtakingly good. You’ll be proud of this meatless recipe. It’s the ultimate dish that will warm your body and soul. 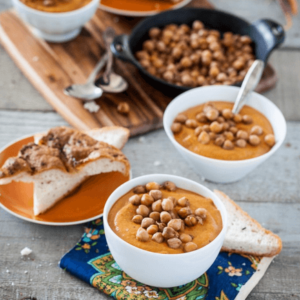 This delightful fresh vegan soup can give you 4 to 6 servings you can eat any time you’re hungry. What are you waiting for? Grab your spoon and dig in! This vegan recipe and beautiful photos are courtesy of Keepin It Kind. 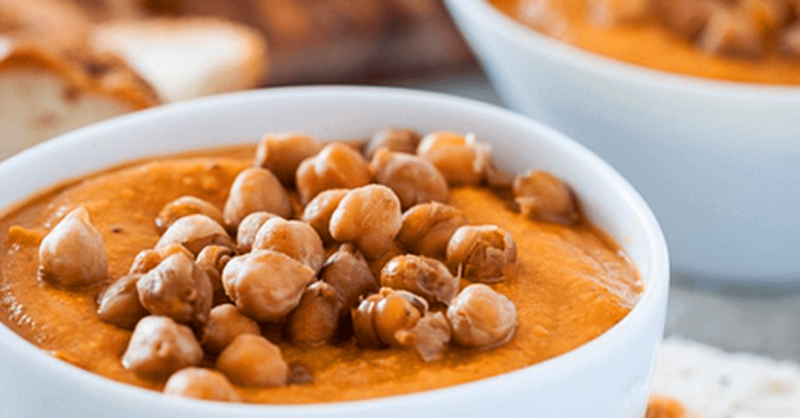 You can get this Vegan Veggie-tastic Almond Carrot Soup With Chickpeas Recipe at the link below.